Colors: Canine color and any pattern of markings. eyes may be of any color and are often light blue. Alaskan Huskies are usually somewhat larger than Siberian Huskies. Alaskan Huskies are usually leaner in build than Siberians. Siberians often have blue or any combination of blue and brown eyes, where as Alaskan Huskies often have brown eyes. Alaskan Huskies are primarily bred as working dogs. They have greater endurance in sled racing than Siberian Huskies do. Gentle and playful, this cheerful dog is very fond of his or her family. A puppy at heart, they are clever, sociable and loving, easy-going and docile. Though they do generally have a lot of energy, especially as puppies. Good with children and friendly with strangers, they are not watchdogs, for they bark little and love everyone. Huskies are very intelligent and trainable, but they have a mind of their own and will only obey a command if they see the point and if you do not display leadership, they will not see the point in obeying you. Training takes patience, consistency and an understanding of the Arctic dog character. If you are not this dogs 100% firm, confident, consistent pack leader, he will take advantage if he can, becoming willful and mischievous. Huskies make an excellent jogging companion, as long as it is not too hot. Huskies may be difficult to housebreak. This breed likes to howl and gets bored easily. They do not like to be left alone, so if this is the breed for you, you may want to consider having two. A lonely Husky, or a Husky who does not get enough mental and physical exercise can be very destructive. Remember that the Husky is a sled dog in heart and soul. They are good with other pets if they are raised with them from puppyhood. Huskies are thrifty eaters and need less food than you might expect. This breed likes to roam. Alaskan Huskies can make wonderful companions for people who are aware of what to expect from these beautiful and intelligent animals. 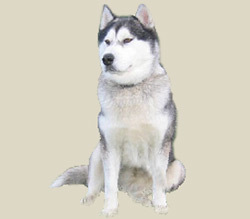 Although there are "exceptions to every rule", there are a number of breed characteristics that are generally present among members of this arctic breed. The coat does not need much care except during the twice a year heavy shedding season, when they have to be combed thoroughly with a metal comb.